With the “deadline” for Obamacare enrollment now upon us, the “spin doctors” are working overtime. The entire exercise reminds me of “Main Street” in an 1800’s western town with all those false facades barely held erect by rotten supports and multiple coats of paint. In the administration’s desperate attempt to fake success, we have been bombarded with promises, projections, and numbers that defy credibility and require a suspension of disbelief to be believed. This is, in truth, a constitutional crisis. The administration and its regulatory dictators have usurped the authority granted to Congress by changing the law to support their political necessities. Why allow the rule of law to derail their runaway train to collective utopia? Once legislation is passed by both houses of Congress and signed into law by the President, it must be enforced as written. I have yet to find anywhere in the Constitution words that allow the executive branch alone to make significant changes in an enacted law without congressional consent. Obamacare has been “amended” over thirty seven times by executive branch orders – altering deadlines, granting dispensations, abating penalties, and promising benefits – either for those with political clout or for the uninformed whose votes are needed to keep the Democrats in power. And where is the loyal opposition? If they weren’t so busy trying to undermine the legitimacy and credibility of party members who actually want to adhere to the constitutional limitations on federal power, they could possibly devise a successful and coherent plan to rid our nation of this abomination, the poorly-named Affordable Care Act. 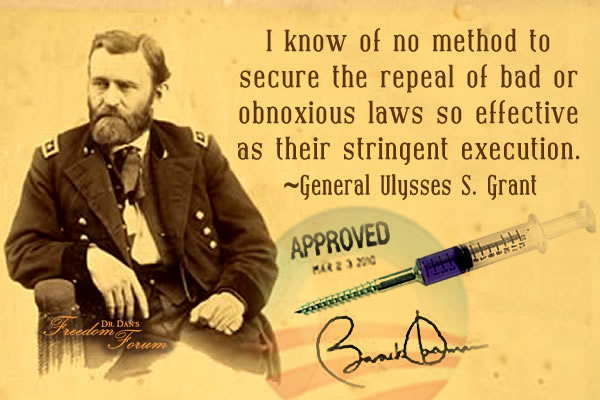 I agree with President Grant. Force the implementation of the entire law as written and enacted. Grow a spine and do it now. As the compliant media continues to disregard its duty to critically investigate the government and provide us with truth, one group of individuals has been ignored throughout the entire process – practicing physicians. When it comes to healthcare decisions, Americans trust their doctors. In spite of past and current attempts by government and insurance companies to cast doubt on the competence and motives of physicians, most of us like our doctors and want them to remain in control of patient care. 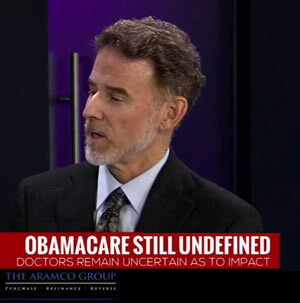 Yet practicing physicians were purposefully excluded from all planning and discussions of Obamacare. The administration chose instead to seek the opinions of academic physicians, institutional physician-members of the AMA, and physicians like Peter Singer and Ezekial Emanuel who are well-known to favor socialist single-payer medical systems. Practicing physicians like me understand from first-hand experience the processes necessary to examine, diagnose, and treat their patients. If the federal government really wanted to redesign the healthcare system to make it efficient, inclusive, and cost-effective, practicing physicians would have been at the forefront of those discussions. People are losing their insurance policies, no longer have access to their regular doctor, and are seeing premiums rise dramatically for inadequate policies with higher deductibles. Most are beginning to realize, as we do, that Obamacare is not about delivering quality medical care to everyone. It is about control. With the implementation of this law, the federal government will ultimately make the decision about whether you live or die. Still missing even now at this critical time, unfortunately, is the input of practicing physicians. With each new federal government pronouncement about ObamaCare, there is a never-ending series of speculative discussions in every media outlet featuring a variety of talking heads . . . EXCEPT practicing physicians. That fact defies all logic. Simply put, the current administration is all about increasing government power at the expense of individual sovereignty and freedom of choice. Most practicing physicians know that competition and choice result in higher quality, less expensive, and more efficient medical care. Practicing physicians could lead the way to achieve that goal if only we were allowed to participate by having equal access to the media and to the political process. Dr. Dan’s guest on Freedom Forum Radio is Joel L. Strom, D.D.S., M.S. Dr. Strom is a widely recognized speaker, fellow at the Jesse Unruh Institute of Politics at USC, President of Strom Political Strategies, and the author of the recently released Learn To Lead: Finding Success As a Grassroots Political Leader. Dr. Strom founded Doc Squads, a project of the Dr. Joseph Warren Institute, a 501c4, co-founded with Dr. Beth Haynes and Mr. Robert Fine. The Institute’s goal is to educate and prepare health care professionals for entry into politics. In addition, he is one of seven founding members of the National Board of Docs 4 Patient Care, a national organization of health care professionals united to help protect the doctor-patient relationship and reform our nation’s health care system. Dr. Strom has the utmost appreciation and respect for our nation’s veterans, and founded Dentistry United for WWII and Disabled Vets, a program designed to provide free dental services for our most valued citizens, our veterans. Dr. Strom lives in Los Angeles with his wife, Holly, and their 21 year‐old daughter, Natalie, a Senior at USC. I agree! Enforce the law and let it fail. Thank you, Dr. Dan. Another good article from a perspective I hadn’t thought of before. I’ve passed this on to others who will also benefit from reading it.